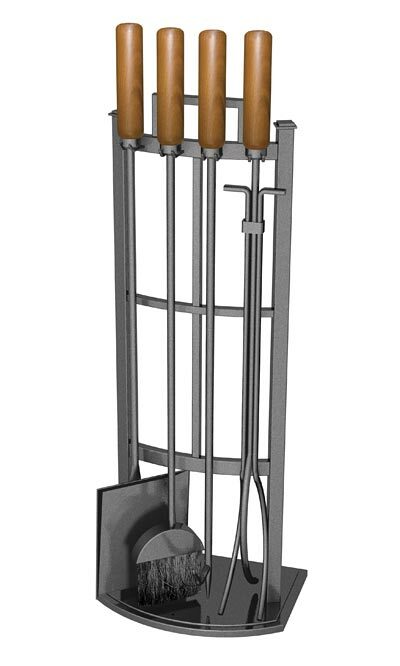 Create a characteristic look around your fireplace with the Panacea Black Five Piece Mission Fireplace Tool Set. Situating this kit next to your hearth keeps the fire tending tools within easy reach, while bringing recognizable style to it. A rounded, wooden handle tops each of the included tools, and the reddish brown color of each enhances any setting. The poker and tongs allow you to easily add logs to the fire, while the included shovel and broom help clean the area once the flames are extinguished. Display each of these tools on the included stand, for a tidy and cohesive look. Square metal bars create the frame of this stand, with additional vertical and horizontal bars forming a windowpane accent in its center. This frame also curves slightly outward for a bit of contrast, and a handle at the top allows it to be repositioned in moments. Add the Panacea Mission Log Bin with Leather Log Tote next to this tool set for a unified and lovely hearth. The black finish throughout the kit ensures a classic look, and its metal construction provides years of faithful service. Bring distinct shape and style to your fireplace with this Black Five Piece Mission Fireplace Tool Set. Some assembly required.